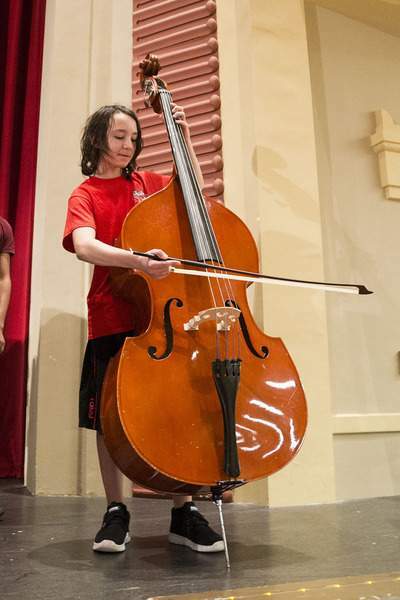 Mike Moore | The Journal Gazette Matthew Newport checks out the new bass that was donated because Chuck and Lisa Surack made a major donation to the FWCS foundation "b Instrumental" program at North Side High School Wednesday afternoon. FWCS students: Chuck and Lisa Surack donate 100 new musical instruments and pledge matching funds up to $500,000 to support the school district's instrumental music foundation. Eve Echeverria: California woman, dying of ovarian cancer, wins a $417 million judgment against Johnson & Johnson, whose baby powder product she used regularly. Through her attorney, Echeverria said her goal was to help other women and lead the company to include additional warnings on its products. White Sox fan: A young Sox fan who successfully scrambled for a foul ball sees it plucked from his glove by a woman seated nearby. But a White Sox marketing exec eases the loss, showing up in the stands to give the young man a baseball signed by broadcasters Jason Benetti and Steve Stone. Chuck E. Cheese: As the kids-oriented pizza chain remodels some of its restaurants, the animatronic Chuck E. Cheese bands are being eliminated, CBSNews.com reported. Though parents and grandparents may be unsettled, the company is betting children used to sophisticated online games won't miss the shaggy robotoid musicians. Northwestern University: Mohammed Ramzan, a 19-year-old member of the university's rowing team who drowned during a practice April 10, didn't know how to swim, according to a report on the tragedy obtained by the Chicago Tribune. USRowing, the sport's governing organization, recommends that all rowers take a swim test, but several members of the Northwestern team told police they weren't tested before joining the team. ESPN: Sports network pulls broadcaster Robert Lee from covering a University of Virginia football game in the wake of the tragedy in Charlottesville. Sportscaster Lee is a young, Asian-American man. The Southern general was a white male who has been dead for 147 years. John Buncich: Federal jury convicts Lake County sheriff of fraud and bribery charges. Buncich, a Democrat, was forced to step down as sheriff upon conviction; a party caucus will select a new sheriff within a month. “This is going to decimate the most beautiful deep-forest wilderness remaining in the state forest system. They promised to maintain it as an older forest. They're just throwing all that out.” – Jeff Stant, executive director of the Indiana Forest Alliance, on news the Indiana Department of Natural Resources' Division of Forestry's plans to sell rights to log nearly 300 acres of Yellowwood State Forest in Brown County. The logging is expected to include trees as old as 200 years. “The Court recognizes Defendants' desire to bring this litigation to a swift conclusion, but it is early and 'time is on our side.' Moreover, 'you can't always get what you want' – but the parties are encouraged to work toward resolution of this matter short of trial, and are reminded that 'if you try sometimes well you just might find you get what you need. '” – U.S. District Court Judge Jane Magnus-Simpson, riffing on the Rolling Stones in denying a motion to dismiss a lawsuit involving a 2015 Stones concert at the Indianapolis Motor Speedway brought by two people who tripped on a curb and were injured after the show. “It wasn't about hating the enemy. It was about protecting and serving your country. And a lot of them made the ultimate sacrifice. And he just never gave up. They were in the water and never knew if the rescue would come, and he just never gave up hope.” – Matt Bierzychudek, grandson of one of the survivors from the U.S.S. Indianapolis, sunk by a Japanese submarine at the end of World War II. After 72 years, the remains of the cruiser were found in the Philippine Sea last Saturday.